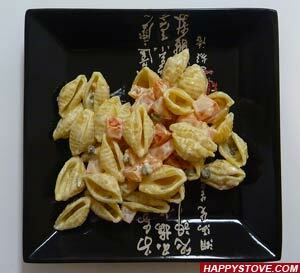 Pasta with Cream Cheese, Tomatoes and Capers is a delicious recipe for a fresh and yummy pasta. Enjoy the spicy touch of capers and the creamy texture of cream cheese in this absolutely stunning pasta meal. In a large pot heat enough water to cook the pasta. When at rolling boiling, add salt, the pasta and let cook as directed until al dente. In the meantime, wash, drain and chop the tomatoes. Mince the garlic cloves. Drain the capers, if in water. In a large skillet heat the olive oil and quickly saute garlic, capers and chopped tomatoes. Turn off the heat and add the cream cheese. If the sauce is too thick, add some water or milk to make it creamier. Adjust with salt and pepper. When the pasta is ready, drain and dress with the cream cheese, tomatoes and capers sauce. Serve hot, garnishing with some basil leaves. Tuna in olive oil goes very well with this sauce. You can drain it and mix it to the garlic, capers and tomatoes and stir fry for a minute before adding the cream cheese. Sometimes the skin of the tomatoes is too tough. It is very easy to remove it after having briefly cooked the tomatoes (for max 20 seconds) in boiling water. Simply peel off the skin with your hands after cooling. Penne Pasta with Smoked Salmon is a delicious main course that combines the delicate taste of salmon with the strong flavor of whiskey in a perfect pasta recipe. Farfalle Pasta with Cream Cheese and Bell Peppers Sauce is a quick and easy recipe for a creamy and yummy pasta. A delicious and simple meal ready in no time that will delight you and your whole family!